An oversized semi-porcelain stoneware salad bowl hand-thrown by potter Stuart Carey. Stuart's pared back pieces have a strong contemporary aesthetic and are an effortless way to introduce colour onto your dinner table. Inspired by everyday functionality, each piece has been crafted in his Shoreditch studio, each piece being individually thrown on the wheel before being glazed and fired. Part of a set of beautiful tableware vessels by Stuart Carey, perfect for everyday use or for display purposes. Stuart Carey is a London based potter who has developed a widely celebrated series of ceramic tableware. His collection consists of fine hand-thrown, semi-porcelain pieces in soft colour palettes of duck egg blue and charcoal cream. Inspired by ‘The Intimacy of Functional Objects’, Stuart Carey developed his strong style during his masters at the RCA. 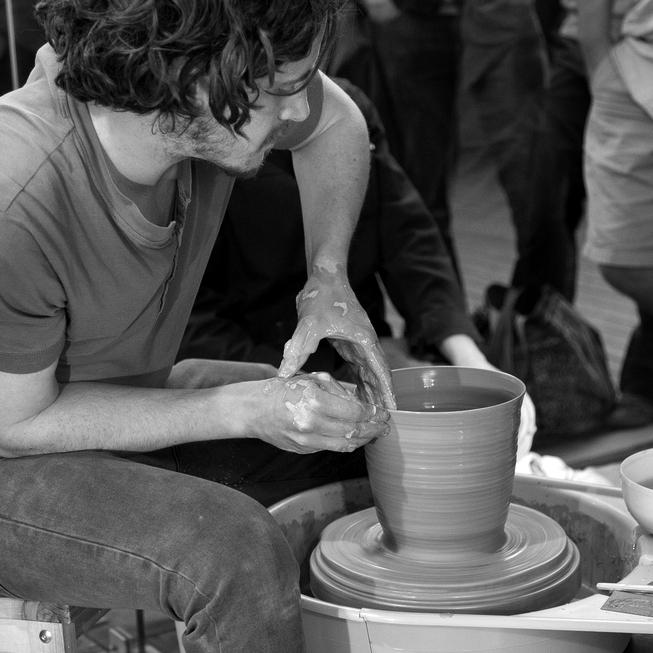 Stuart Carey is currently co-founder and director of The Kiln Rooms, an open access ceramics studio and educational space in Peckham, South East London.